We have a range of specialist authentic Indian Shikar tents we hire for stylish boutique glamping creating a unique, colourful space to entertain friends and family and add a bit of luxury or extra accommodation to your event. Our camping tents are ideal for chill out areas and small drinks parties on the lawn and we offer a variety of tent hire packages to suit all types of camping, parties and events. We travel far and wide with these tents using them at festivals, weddings guest accommodation, wedding night accommodation or just for a bit of luxury camping. Our wonderful, exotic Indian fabric tents are equipped with beautiful interiors, proper beds, scatter cushions and more creating a wonderful atmosphere at any event. Whether you're hosting a fun children's party in your garden, a sophisticated, posh garden party, an intimate romantic boudoir setting for your loved one, an important corporate meeting or hospitality event, hire our Indian Shikar tents to create a unique and luxurious space to entertain. Call us at Malmesbury Marquees on 01666 575 470 for more details and to discuss hiring our luxury Indian Shikar tents for some glamorous camping. 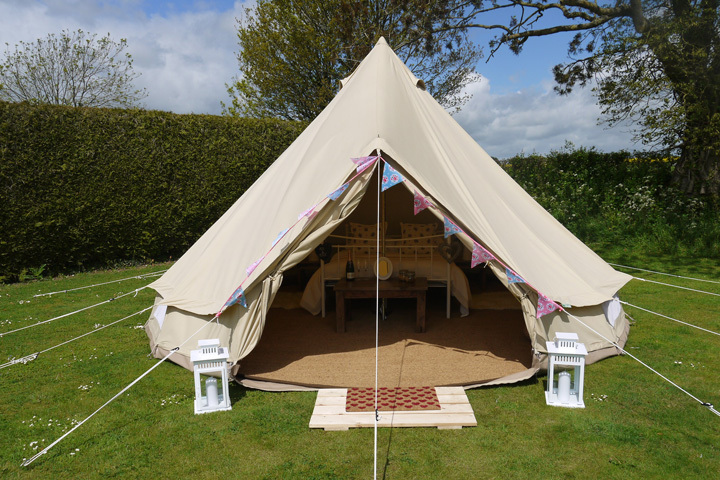 Malmesbury Marquees offer a range of Bell tents to hire for your festival, party or event. 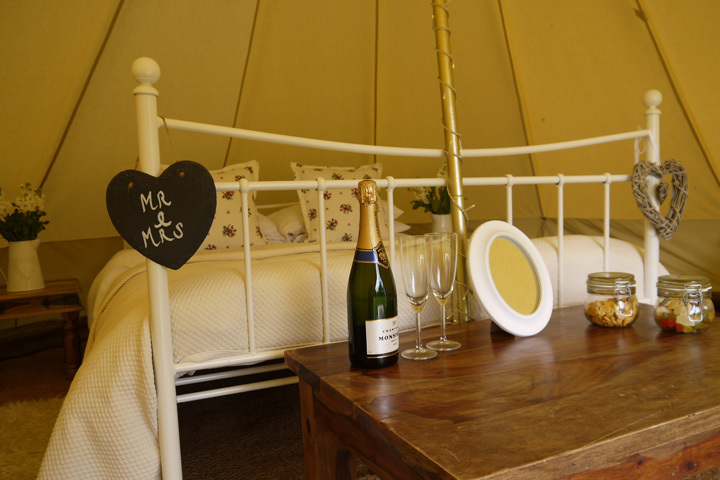 More details can be found on our sister website, The Luxury Tent Company, which specialises in bell tent camping packages where we can also create pop-up Bell tented villages for luxurious additional guest accommodation. 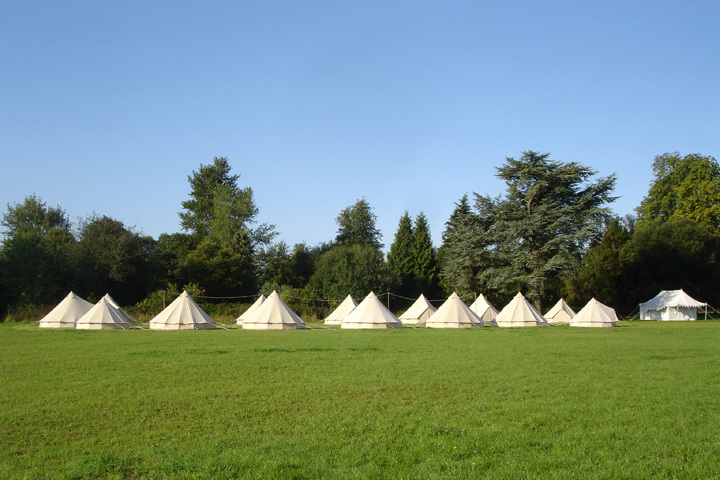 Please do contact us on 01666 575 470 to disuss hiring Bell tents or for even more details about our Bell tent camping packages and costs visit www.theluxurytentcompany.co.uk. The Indian Shikar tents can be used for wedding or party accommodation or in our festival boutique camping at WOMAD festival. 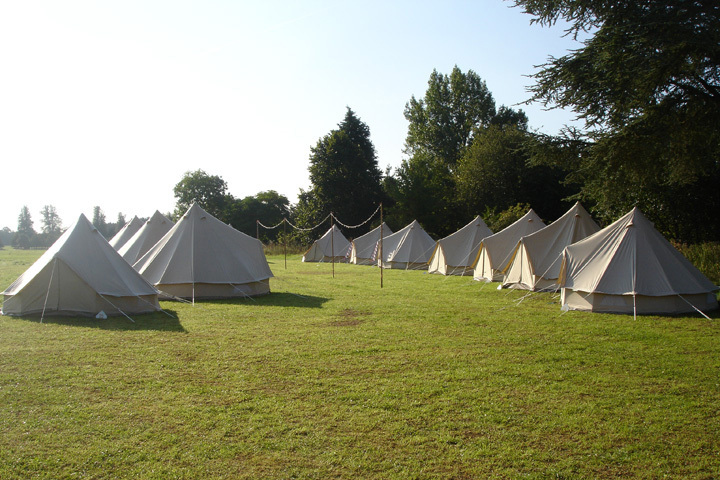 Each tent has a double bedroom and an extra children's bedroom/dressing room. In a range of lining colours they are fully furnished with bedding and Indian furniture. Our 30ft Indian round tent, ideal for an informal gathering or chill out tent. For more luxury camping information, please call Malmesbury Marquees on 01666 575 470 or email info@malmesburymarquees.co.uk. "Just a note to thank you and your team, Dave and the other chap (sorry can't remember his name), for providing such a fantastic service with regard to the furniture we hired from you. We had a brilliant day and we didn't have any rain which was a bonus."